Should You Pre-Order a Lytro Camera? Spot Cool Stuff was amongst the first blogs to report on the Lytro, an entirely new sort of camera that allows photographers to focus their shots after they snap their pictures. The “light field cameras,” which were a concept then, are reality now. Lytro is accepting pre-orders on their website as we type. Lytro promised a photography revolution. Their product looks the part. Long and square, a Lytro camera resembles a flashlight. It’s only 1.6 inches (41mm) high and wide; that’s a bit more than the thickness of four Apple iPhones stacked on atop another. While we like the size of the Lytro, the shape and controls will take some getting used to. You grip a Lytro camera a little like an over-sized pen. There’s a small power button on the bottom and shutter button at the top. Zooming is done by moving a slider. Adjusting the exposure is by choosing the model point on the 1.46-inch low-resolution touchscreen on the back of the camera. That’s pretty much the extent of the manual controls. Spot Cool Stuff absolutely loves the focus-after technology incorporated into Lytro’s light field cameras. Check it out below by clicking on that part of the photo you’d like to focus on. Lytro also makes sharing photos easy. Those who pre-order a Lytro can store an unspecified number of their pics on the Lytro cloud cost-free. From there you can imbed them on a webpage (as seen below) or view them with an iPhone app. The downsides: The software needed to edit Lytro shots currently runs only on a Mac (OS X 10.6 or higher); a Windows version of the software won’t be available until later in 2012. There’s also some question as to how well the camera shoots in low light. 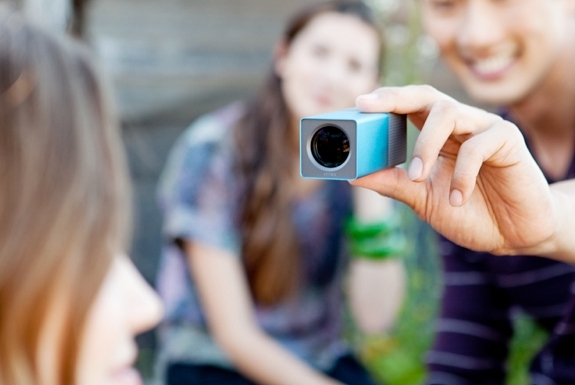 There’s no question of the shape of images taken with a Lytro: square. Some people will undoubtedly like the retro-Polaroid photo shape. Others (Spot Cool Stuff among them) prefer widescreen pics. 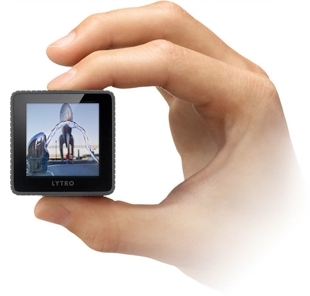 A Lytro camera weighs 7.55 ounces (214g). That’s not at all heavy, though it is 2.5 ounces more than the best selling Canon PowerShot ELPH 300 ultra-compact point-and-shoot weighs. The Lytro’s 8x optical zoom is very impressive in this form factor. We also like the constant f/2 aperture. 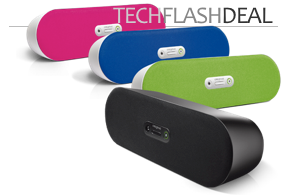 What we don’t much like is the Lytro’s storage system. Pictures are saved to an internal flash drive and downloaded via a relatively slow micro-USB cable (which is also used for charging). Spot Cool Stuff would far prefers cameras that use memory cards. With memory cards you don’t use camera battery power to download photos. You also have infinitely expandable memory—simply swap in a new card. Speaking of battery power, Lytro says that photographers can fill up the entire internal memory on a single charge. But we don’t yet know how much longer beyond that the battery will last. And, anyway, the battery ratings from camera manufacturers are almost always overly optimistic. Lytro’s technology is incredibly cool. But it doesn’t seem as if their cameras are ready (yet) to replace your SLR. Between questions about usability issues and the various downsides noted above, you’d be wise to wait for the Lytro reviews to come in. (Spot Cool Stuff expects to publish our review in January of 2012). At this point, if you are looking to replace your current camera, a Lytro is not your answer. Instead, consider the micro four-thirds Sony Nex-5 (which sports wonderful technology of its own), the SLR Nikon D3100 or one of the point-and-shoots in the Canon PowerShot line. That said, if you are an early adapter type and already have everyday photography gear you are happy with, go head and take a flier on a Lytro. You’ll undoubtedly have fun playing around with one and Lytro’s light field technology is like nothing you currently have in your camera collection. Pre-ordering a Lytro will set you back $400 for an 8GB electric blue or graphite-colored model (that stores 350 photos), or $500 for a red hot 16GB version (that stores 700 pics).